What role do beer writers play in the culture and growth of craft beer? Journalists and bloggers play a huge role in the growth of craft beer. Journalists are a unique breed. They’re ‘True Reporters’ in that their purpose is to present the facts. Their opinions and ratings are excluded. They let readers and listeners draw their own conclusions. This is the core difference between a blogger and a journalist. Bloggers like to give their opinion; they like to tell you what’s good or bad. For consumers, this can be a challenge. They follow the lead of those they respect. Likely we should simply call bloggers “personalities.” I will also lump in radio and podcast talk-show hosts into this category. The public develops a love of and an affinity for personalities. They’ll simply buy off a recommendation of that person, because they trust in, believe in, and want to be like that personality. The guys on KISW, a Seattle-area radio station, love beer. 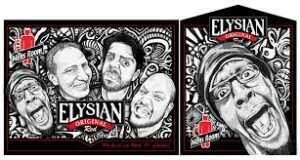 In 2009 their afternoon drive-time show, The Mens Room, partnered with Elysian Brewing on a beer that’d contribute to nonprofit causes. Their simple line, “Because We Think It’s Yummy” has sold loads of the beer. Is the beer good? Sure. It’s an amber ale, tastes of caramelly malts with a bit of citrus hops; its got a bitterness that’s not overwhelming. At the time of its release, I’d never seen anything like it. Guys were flooding into my beer store, buying it by the case… we’re talking fizzy yellow beer drinkers who are used to paying under $20 for a case of 24, putting down over $50 for a case of 12 bombers — simply because the guys on the radio said it was “yummy.” Oh, the power of personality! Journalists also have an impact on consumer beer buying decisions. For journalists, I’d cite those working for credentialed radio stations (NPR, Komo Newsradio, etc. ), print beer publications (All About Beer, Draft, The Beer Connoisseur, Celebrator Beer News, Northwest Brewing News, etc. ), other print publications (Science, The Smithsonian, etc. ), and television (even though, IMO, a lot of the TV journalists fall into the “personalities” category these days). We regularly see people coming into the shop with print articles in hand, or notes from a news spot they heard. The citizen blogger has been gaining more traction. This person is also a “personality,” sharing with us their opinion, likes and dislikes. Some omit their “dislikes” because of rules of etiquette, others openly flame. As for the debate as to whether bloggers who only “share the good” aren’t trustworthy, I’d disagree. It really depends on the “facts” presented. When it gets into good vs bad, there are often two sides to the story. If a beer or beer place was “bad,” why was it bad? Was the terrible experience intentional? Likely not. What’s the story behind it? Rarely do I see a bad review jump into the “whys” behind the bad experience. Thus, flamers and slammers simply appear less trustworthy, IMO. As for the individual citizen blogger, we don’t see as many coming into the shop carrying their lists or blogposts. But as a small business owner juggling multiple duties, I use their blogs regularly to promote craft and import beers in store. I do this by sharing links to relevant posts and podcasts on facebook, twitter, and via the shop’s newsletter. How do I locate the relevant articles? Via Google search. That’s why I can’t emphasize enough for beer bloggers to optimize their posts for search engines. Are we advocates, critics, or storytellers? Beer personalities are all of the above — advocates, critics, and storytellers. Some bloggers simply repost press releases. I’d discourage that, unless they’re also including an introduction of why they feel its important to share. Simply inundating the Web with standard boilerplate doesn’t add much value. If you’re re-posting a press announcement of a new beer release or a brewery anniversary party, what makes it important? Are you also looking forward to trying it or attending? Have you already tried it? Have you already visited the brewery? Share your thoughts. Remember, as a blogger, you’re a personality… unless your intent is journalism. What stories are not getting told and what ones would you like to never hear about again? Lisa Morrison, aka The Beer Goddess, of Oregon’s Beer O’Clock Radio says it best, “Every beer has a story.” I agree. I also feel there are a lot of stories not being told… or if they are, they’re not being found. When drinking the beer, don’t just think about whether you like it. Don’t just think about its style. Consider its story: Who made it? Where was it made? Why was it made? Every beer has a story! What’s your beer media diet? i.e. what publications/blogs/sites do you read to learn about industry? I read a lot about beer. My staples on the Internet are the Washington Beer Blog and Beer Pulse. When looking for opinions, I simply use Google and search the beer name, then flip through the resulting blogs and pods. And Google search. I use Google search a lot! I can’t over-emphasize how much I search for beer. I scour the “news” section with keyword “beer” several times a week, and am continually looking up and researching beers by name and/or brewery on the regular Web search. I also keep an eye on what Alcohol Justice is saying. They’re the self-proclaimed “watchdog” of the alcohol industry and are likely the biggest “anti-alcohol” advocate in the United States. Are all beer journalists subhumans? Is beer journalism a tepid affair and/or a moribund endeavor? And if so, what can be done about it? Again, I’d say this all has to do with our confusing “personalities” with “journalists.” They are two different beasts. There are way more “personalities” out there than true journalists. True journalists don’t let their opinions seep in. When looking to “personalities,” I tend to navigate toward those who are “editorialists” or write in “memoir” fashion. In the spirit of tipping the hat when someone gets it right, please also share a piece of beer writing or media you love — it doesn’t have to be recent, and it could be an article, podcast, video, book or ebook — and explain a bit about what makes it great. I’ll include links to those articles as well in my roundup for easy access reading. I have a physical folder of clippings and printed blogposts to which I regularly refer. Alas, it’s at the shop in my filing cabinet so isn’t physically with me to point to as I write this post. I just learned of a this one this morning. It’s from 1984 and was a local TV spot… and I LOVE IT! They explain the difference between mass-produced beers and handcraft beer, in terms that the consumer understands: Mass-produced beer as the “Velveeta” or “Wonder Bread” of beer, in that it contains 40% of ingredients that are filler. Drink beer on how they taste. Different beers are made of different recipe. The passion of handcraft brewers. The importance of following your dreams. It takes time to develop a good beer recipe. People will keep looking for beers that please their palate. People will pay for good beer. …plus the old Rainier commercials that I fell in love with years ago. Ah, memories! Every beer has a story. Its funny you list beer blogs that you frequent and yours is now definitely going into my bookmarks! Great writing! Thanks for giving the little guys (beer blogger) credit Cheers!